BURNET, Texas (Dec. 4) – In the four months since R. Lee Wrights began exploring the idea of seeking the Libertarian presidential nomination he has become even more convinced how critical it is for the Libertarian Party to be the anti-war party in 2012. “The Democrats have not just completely failed to stop the ever expanding cycle of war, they continue to enlarge the cycle,” he said. “When the Republicans take control of the U.S. House, there will be no one left to speak for peace, no one but Libertarians,” Wrights said. Thomas Hill, of Charlotte, N.C. has known Wrights for 10 years. He agreed to chair the exploratory committee because he said Wrights has proven to be a consistent and principled libertarian. Other members of the committee include: Brian Irving, press secretary; Robert Butler, treasurer; Julie Fox, assistant treasurer; Sean Haugh, events coordinator; Zachary Smith, campus coordinator, and; Katie Brewer, social media coordinator. He said he is determined that whoever wins the 2012 nomination is totally committed to proclaiming the message to stop all war. To that end, Wrights has pledged to commit ten percent of all donations to his campaign to gain ballot access in all 50 states. The committee also wants to ensure the 2012 nominee is equally committed to running on an unequivocal libertarian platform. “We need a candidate who is not ashamed nor afraid to proclaim the true libertarian message of individual liberty and personal responsibility, without compromise, without watering down and without pandering to those who are afraid of freedom,” said Irving. Wrights, a Winston-Salem native, is a writer and political activist living in Texas. He is the co-founder and editor of the free speech online magazine Liberty For All. 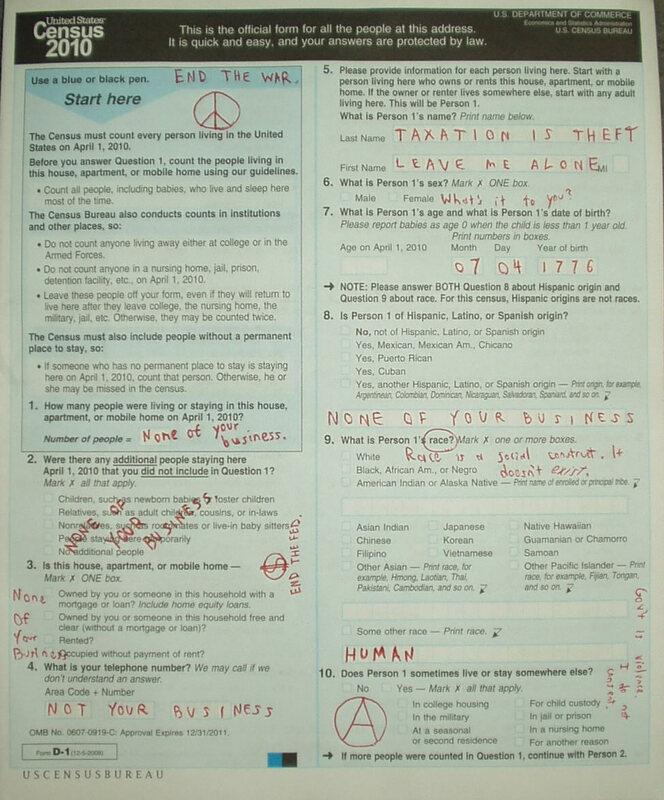 I first began thinking about the census a few years ago while talking to the perennial Libertarian candidate Lorenzo Gaztañaga. I was helping the Libertarian Party of Maryland at a fair, and a man (whose name I do not recall) had been asking me about the Green candidate for U.S. Senate, Kevin Zeese. This man told me that he didn’t want to vote for the Republican candidate Michael Steel because Steele might then go on to become President. I looked at him with obvious confusion on my face, to which the man responded, “We must keep the White House white.” I turned away from the man with disgust and walked back under the tent we had set up. When Gaztañaga got back, I told him about the incident, and Mr. Gaztañaga said to me, “Good for you. Good for you.” Presently, he told me that when he and his wife (who is currently running for Governor here in Maryland) filled out their 2000 census, they refused to give a racial identity. Instead, they wrote in “HUMAN,” since they recognised themselves simply as members of the human race. I loved this idea, and vowed that I would do the same from there on out. Well, the 2010 census has arrived! And, boy, am I excited! Why? Because this is the first of many census questionnaire that I shall be boycotting. Interestingly, I have heard many people tell that they will not include any information about race, since it’s “none of the government’s damn business.” Naturally, I agree. But, honestly, I don’t see what business it is of the government as to how old I am, either, or with how many people I live. So I would simply recommend, boycott the census. This is a very simple form of civil disobedience, since all it requires you to do is to go about your day normally. There’s no reason you should have to waste even a second on the census if you don’t actually want to. Despite government propaganda, the world will not come to a screeching hault if they don’t have your name, age, date of birth, gender, and place of residence. Remember, you are not their slave; the courts have repeatedly said that the government doesn’t owe you anything, so it stands to reason that you cannot possibly owe it anything, either. Of course, the government threatens to steal $100 from you should you fail to fill out the census (and $500 should you present false information), however I have been informed that punishment for failure to respond is not usually enforced. Naturally, one must access the risks for herself. And, naturally, since I believe one should live by what she or he preaches, I’m following my own advice. I actually did fill out the census, but only to inform the central state that I do not consider many statistical data to be any of its business. You can see my census answers here. Finally, even though the return envelope had one of those pre-paid labels on it, I have opted to place a stamp on the envelope. It’s my general understanding that those who do not include their own stamps will have their mail paid for by the Census Bureau, which of course gets “its” money in turn from innocent tax-payers. Since I did not want to see tax-payers have to shell out forty-four cents on my behalf, I opted to spend my own forty-four cents in this act of civil disobedience.